I lost touch with books for about a decade because of life but thankfully I am able to return to this beautiful world. Eclectic mix from YA to erotica. I blame fanfic. The second in this wonderful series really ramps the action up. I much preferred the pace of this instalment and thankfully the story gets more messy by that I mean curious and enthralling. It wasn't that 'I couldn't put the book down' but more like 'I didn't put the book down.' Marissa Meyer certainly knows how to keep you interested and this time round I find myself completely invested. The world is becoming to feel more real rather than just background to the action. The characters develop and as they say the plot thickens. I prefer the characterization of Wolf marginally more than Kai (in fact I prefer Thorne to Kai) but again I didn't find the companions for Cinder and Scarlet appealing but once again I just think it's down to a personal preference. However where Cinder made me swoon so does Scarlet. They are gripping characterizations, layered with flaws, whims and angst but nonetheless strong and determined. In short they're awesome and alone make the book worth reading. 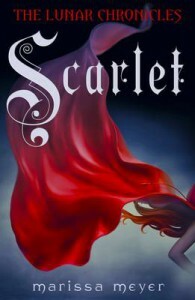 I found this book more unpredictable, maybe because Scarlet is too when compared to Cinder but on the whole I enjoyed this book a lot more. Definitely recommended series.